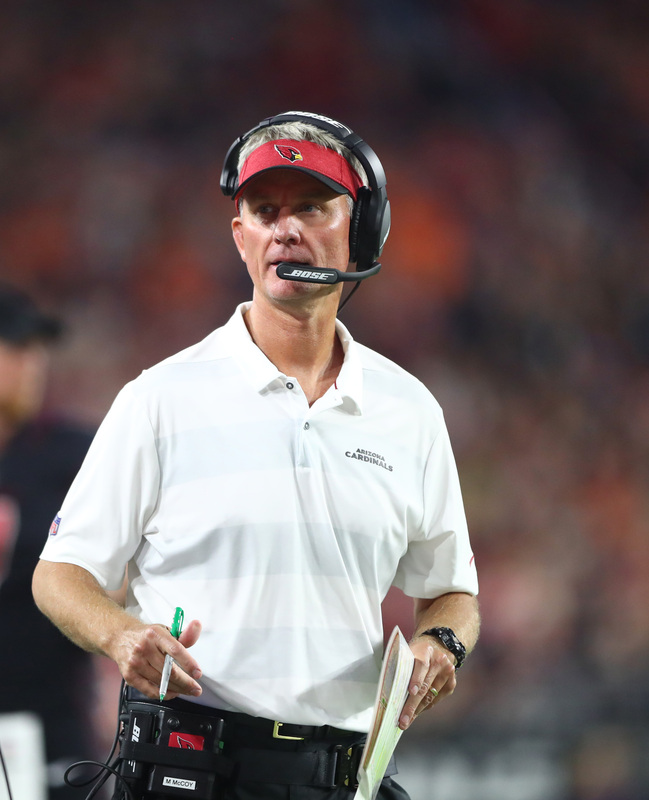 After a disastrous 45-10 loss to the Broncos on Thursday night, the Cardinals fired offensive coordinator Mike McCoy. To replace him, the Cardinals promoted quarterbacks coach Byron Leftwich. McCoy’s job security has been a topic of discussion for weeks. Through seven games, the Cardinals have averaged just 13.1 points per game, which ranks 31st in the NFL. They’re also dead last in total yards per game, third-down conversion percentage, time of possession, and rushing yards. Something had to give, and the embarrassing loss to Denver was the straw that broke the camel’s back. It’s an ironic end to McCoy’s tenure in Arizona since the Broncos fired McCoy in the midst of the 2017 season. Denver started off strong with a 3-1 start last year, but the team lost patience after a six-game losing streak knocked them out of playoff contention. This year, the Cardinals had enough after a 1-5 start and an embarrassing primetime loss in which Josh Rosen lobbed his third, fourth, and fifth interceptions of the year. Leftwich, the Jaguars’ longtime quarterback, was brought in by former coach Bruce Arians as a coaching intern in 2016. Last year, he was hired as the team’s quarterbacks coach. Leftwich doesn’t have previous OC experience, but he did call plays in a couple of 2017 exhibition games. Leftwich will make his OC debut on Sunday, Oct. 28 against the 49ers. After that, the Cardinals have a Week 9 bye. I really wish Rosen had a good OC and a good OLine. I want to see what he can do with any time in the pocket. I agree. But that’s pretty much every QB at the NFL level, isn’t it? makes sense. I mean who calls that many pick 6’s and sack fumbles. It can’t get any worse……….or can it? The only way it could get worse for Cardinal fans is if Larry Fitzgerald was overlooked for induction into Canton the way Don Coryell was….but that would be an injustice of epic proportions. Leftwich is in a bad situation to be taking over. If he can make the Cards offense go, he’ll be a head coach in the next couple of years. Though I think the problem is that the Cards just don’t have the talent they think they have and will have to do a major rebuild. The cardinals offensive line is swiss cheese. Pretty bad when your whole offensive line cant get on the same page to run the offensive play called. Doesn’t matter who is calling the plays if the fundamentals of blocking are absent. Cardinals looking like the Browns of previous years. I get the players sucking, but the coaching moves…Geez.